Each year, the Ocean Cruising Club (OCC) recognises the outstanding achievements of blue water sailors and brings them to the attention of the sailing community. The OCC Seamanship Award is presented to Gavin Reid*, the skipper and the crew of Mission Performance during the 2015-2016 Clipper Round the World Race, for responding to a distress call, standing by under difficult conditions, and swimming to M3, climbing the mast and freeing a crew member who had been trapped at the top for 9 hours. 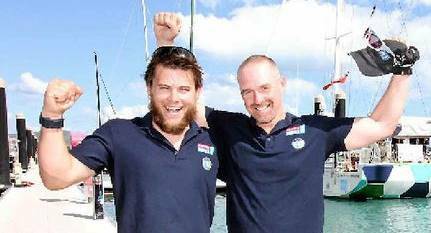 In January 2016, Gavin Reid from Cambridge, UK, was crewing aboard Mission Performance on the sixth (Hobart to the Whitsundays) leg of the 2015-2016 Clipper Round the World Race, when a distress call was picked up from M3, a yacht returning from the Sydney Hobart Race. M3 had a rope around its propeller, a damaged mainsail and a man stuck up the mast and entangled in halyards. M3’s skipper requested assistance to release him. Mission Performance was the nearest yacht to the stricken vessel. Greg Miller*, Mission Performance skipper, responded to the call and closed on M3 but sea conditions made it too dangerous to go alongside without endangering both boats. Miller stood off 150m away upwind. At daybreak, Gavin Reid, who is profoundly deaf and had almost no sailing experience prior to signing up for the Clipper Race, volunteered to swim over to the other yacht. The crew threw a line to M3 which Gavin used to reach the stricken yacht. He found four crew largely incapacitated and unable to help the fifth man. Using the one remaining staysail halyard, Gavin was able to hoist himself two-thirds of the way up the 65ft (20m) mast, then climb the rest of the way hand-over-hand on the swaying mast to reach the crewman. He spent two hours untangling the lines to free the man and help lower him down safely. The Seamanship Award is made “to recognise outstanding feats of personal bravery at sea or exceptional acts of seamanship” and Gavin’s and his mates’ actions – the manoeuvring, the swim and the mast ascent – reflect these criteria perfectly. See the story and video on BBC News. The OCC Award of Merit goes to Victor Wejer* for his unselfish and outstanding service, his extensive advice to international Arctic sailors, and his remote support of yachts sailing the Northwest Passage. The OCC Award of Merit is open to members or non-members who have performed some outstanding voyage or achievement. Over the years Victor has collected information concerning methods, shelters, anchorages, ice conditions and equipment from voyagers who have succeeded as well as those who have failed in their attempts to sail this unique and often unpredictable passage. Victor has collated various accounts to create a truly valuable body of work which he updates and regularly shares. His Yacht Routing Guide can be downloaded from the RCCPF website. The Geoff Pack Memorial Trophy recognizes the person (member or non-member) who, by their writing in print or online, has done most to foster and encourage ocean cruising in yachts or other small craft. This year it is awarded to Sue Richards* and the Noonsite Team: Val, Jeremy and Noah. Sue Richards is Editor of the website www.noonsite.com and over the past two decades has led the development of this site to become the cruising yachtsman's primary source of worldwide cruising information. Noonsite has a wealth of up-to-date information on practically every country of interest to cruising yachtsmen and has become the yachtsman's "first call" in planning routes and passages. Through their diligence and dedication, Sue and her team enhance the safety, enjoyment and security of the global cruising community. Noonsite was started by Jimmy Cornell and acquired in 2007 by World Cruising Club. Read more here. Nominations are made by OCC members, but suggestions for consideration are welcome from the cruising community at large. A panel of judges comprising accomplished OCC members from several continents made the selections. The final selections were ratified by the General Committee of the Ocean Cruising Club. Additional information about the winners will be posted on the OCC website as it becomes available. High resolution images are available by contacting PR@oceancruisingclub.org. We sincerely thank all the members who submitted nominations.